Fed-up conservatives in the Great State of Texas decided to send a crystal clear message. 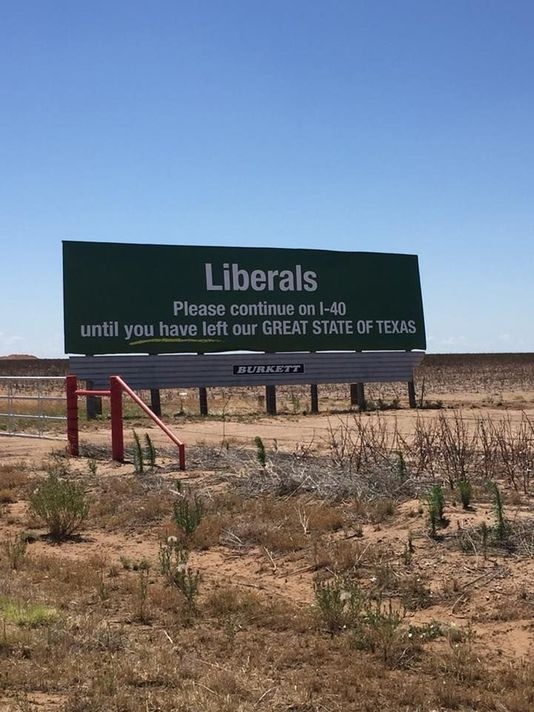 They paid for a massive billboard in the Texas panhandle urging any liberal drivers passing through to keep driving until they’ve left the state. Unfortunately, today’s ultra-sensitive liberals can’t take a joke. Oh sure, they can rail against and mock conservatives (especially Christians) in every possible public venue. But hit back at them, and liberals start crying like kindergarten children. Despite its fairly remote location, pictures of the billboard quickly went viral on social media, creating a heavy backlash against the advertising company that owns the billboard spot. That company felt compelled to eventually ask their client to remove the billboard, which a full reimbursement.